Dove have been in the spotlight this week due to their new Baby Dove adverts. "36% are for feeding him when he cries, 64% are passionately against it. What's your way?" "So whether you're among the 66% who think that breastfeeding in public is fine, or the 34% who think otherwise, whatever choice you make, we are with you every step of the way." Unsurprisingly parents weren't impressed and have taken to social media to express their outrage. "We believe there are many ways to be a great mum or dad. "Our campaign simply aims to celebrate the different approaches and opinions around parenting, including whether or not mums choose to breastfeed in public, recognising that it's ultimately what works for you and your baby that matters the most." However that's certainly not what their first quote implies. The terms "say it's fine" and "put them away" clearly implies external judgment of others and that 25% don't feel people should breastfeeding in public. If indeed they intended to suggest they support all parents, they really need to sack their marketing team. 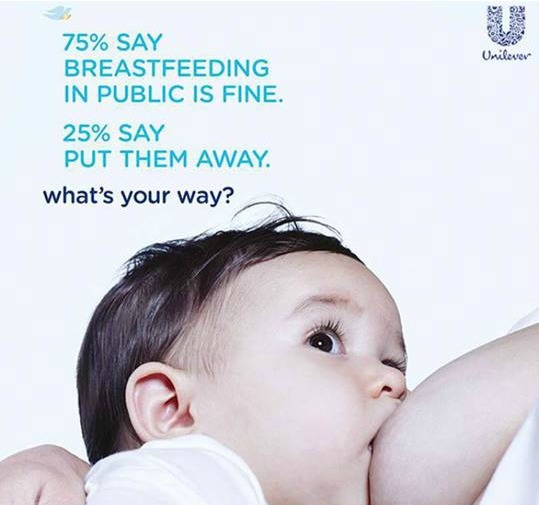 "75% feel comfortable breastfeeding in public, 25% prefer not to. What's your way?" If he cries 10 mins after he's finished an 8 ounce bottle, or if he's crying due to hunger because someone missed an earlier hunger cue like lip smacking and head turning? Even if someone chooses to feed their baby to a schedule, are we seriously meant to believe 64% are "passionately against" others responding to their babies cues and are passionately for leaving them hungry? Statements like this are incredibly divisive; mothers are fighting back against the "judgement" manipulation they've watched play out promoting formula, trying to play parents off against each other.